The only dispute between México and Brazil since the emergence of the World Trade Organization is a minor matter — Brazil opened a case in 2000 when it accused México of enacting anti-dumping measures on electronic transformers that were tougher than allowed under the WTO agreement. Brazil, as it turned out, sought consultations with México, and the case never proceeded to a full WTO panel. But this week’s seen the conclusion of a contest between the two Latin American countries with much more wide-ranging consequences than policy on electronic transformers — the final round to select a new director-general, and it’s a contest that Roberto Azevêdo, a Brazilian diplomat and trade representative, has won the final nomination for the job, and will likely be officially confirmed as the next director-general on May 14. Azevêdo defeated former Mexican trade minister Herminio Blanco, in a contest between two men that represent the two largest economies in Latin America. As Brazil’s man in Geneva for the past five years, Azevêdo won the post in large part due to his status as a knowledgeable WTO insider. Blanco, who helped draft the landmark North American Free Trade Agreement in the 1990s among the United States, Canada and México, had more high-level experience in government (Azevêdo has never been a cabinet-level minister in Brazil’s government), but has spent his time out of government in the private sector, not in Geneva. To a degree, the showdown marks the growing, if friendly, rivalry between México and Brazil — the Mexican economy, with a GDP of $1.76 trillion, and an estimated 2012 growth rate of 3.8%, is expected to overtake Brazil’s economy in the next decade. With a GDP of $2.36 trillion, Brazil remains the largest economy in Latin America, and it’s forecast to improve on a paltry 2012 GDP growth rate of 1.7%. Azevêdo’s win demonstrates that Brazil, one of the four initially identified ‘BRIC’ emerging economies, remains a widely respected player in global economic policymaking, despite its economy’s recent stumbles and a somewhat ambivalent attitude toward global trade from its center-left presidents Luiz Inácio Lula da Silva and Dilma Rousseff, though Brazil was a founding member of the South American free trade bloc, Mercosur (Mercado Común del Sur) in 1991. Blanco’s loss is a rare diplomatic setback to Mexican president Enrique Peña Nieto, who took office less than six months ago and has already enacted a whirlwind of domestic reforms that have made his country once again a darling of international investors. Azevêdo will succeed Pascal Lamy, the Frenchman who’s been the WTO’s director-general since 2005, and he’ll take over the organization at a time when its role in global trade seems to be on the decline. The Doha round of negotiations, which began way back in November 2001, now seem nearly hopeless, with the WTO members split between the developed world and the developing world. Indeed, the developed/developing struggle came to define the final round of the race to become the next director-general, with the United States, the European Union, Japan and South Korea allegedly backing México’s Blanco, and China and the rest of the developing world backing Brazil’s Azevêdo. Despite the divide, U.S. and E.U. 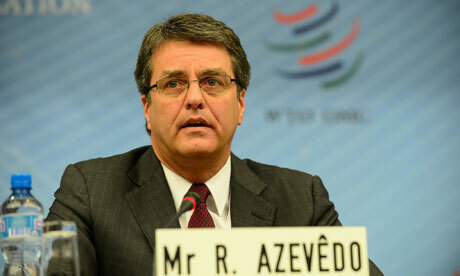 officials were never intensely opposed to Azevêdo, who will become the first Latin American director-general of the WTO (or its predecessor, the General Agreement on Tariffs and Trade) and the first director-general from the ‘global south’ since Thailand’s Supachai Panitchpakdi held the job from 2002 to 2005. But the last major Doha negotiations broke down in July 2008, and they haven’t resumed in any significant way since the global financial crisis that exploded later that year. While the WTO has seen its membership grow by 17 since the Doha round began (including China in 2001, Saudi Arabia in 2005, Vietnam in 2007 and Russia in 2012), many countries have moved toward bilateral and regional trade accords. Some WTO proponents fear that such smaller trade agreements undermine the role of the global trade regime, though proponents argue that regional agreements work toward the same underlying goals of greater free trade among the world’s nations. 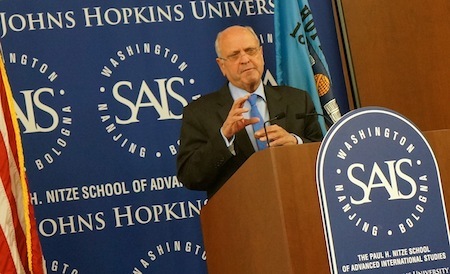 Former World Trade Organization director-general Michael Moore — a former New Zealand prime minister and the country’s current ambassador to the United States — spoke Friday afternoon at the Johns Hopkins University’s School of Advanced International Studies about world trade, regional trade and the future of the WTO’s Doha development round of negotiations — a round that begin under Moore’s tenure in 2001. The Doha round seems more hopeless than ever today, and the United States is currently ramping up for the biggest round of regional trade agreements since the adoption of the North American Free Trade Agreement in the 1990s, with high hopes for the Transatlantic Trade and Investment Partnership (TTIP) between the United States and the European Union as well as for the Trans-Pacific Partnership (TPP). The latter, currently a free-trade agreement among New Zealand, Chile, Singapore and Brunei, would expand to create a Pacific free-trade zone to include the United States, Canada, México, Perú, Australia, Thailand, Malaysia, Vietnam and others — including, quite possibly, Japan, given prime minister Shinzo Abe’s enthusiasm to join negotiations as well. Moore (pictured above) joked that though he’d written in the past as WTO director-general against regional trade agreements — they are sometimes thought to distract from the push for global reductions in tariffs and other barriers to trade — New Zealand’s been rather promiscuous about regional trade over the past decade, noting the irony that in his current role, he’s now involved with TPP negotiations. He cautioned that if the WTO’s member states don’t get moving in Geneva soon, the WTO’s dispute system could suffer, and he now argued that TTIP and TPP could actually point the way forward for the world trade regime. Moore affirmed his support for New Zealand’s candidate for WTO director-general, Tim Groser, who previously served as ambassador to the WTO from 2002 to 2005, currently serves as New Zealand’s minister for trade and climate change issues, though he has nearly 30 years of experience prior to his appointment as WTO ambassador working on trade policy. So Groser clearly known trade policy and he clearly is on the front lines of policy issues in the Asia/Pacific and TPP negotiation. Moore added, however, that any number of candidates can do the job, and he noted that the selection process has much improved from the days when the United States and Europe would essentially decide, perhaps in tandem with Japan — Moore said it was a good thing that nominees feel they have to visit the capitals of small countries as well as large countries to make their pitch. Three regions — the Middle East, Latin America and Africa — are vying for their candidates to become their region’s first respective director-general of the WTO (or its predecessor regime before 1995, the General Agreement on Tariffs and Trade).